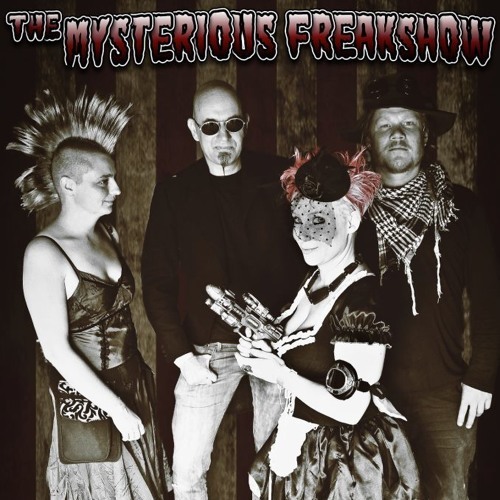 The Mysterious Freakshow are a South-West based Alt-Rock and Steampunk Band formed in 2012. Mixing dark pyschadelic rock with pop sensibilities. Singer/Songwriter - FEY PINK - has teamed up with KYE GODFREY on Bass, TRACY AUSTIN on Drums, and TOM ROSENBLOOM on Guitar. Together from their studio on the edge of Dartmoor they have created a number of brooding, atmospheric and beautiful songs that are both reminiscent of times passed yet have a distinctly modern feel. Their unique take on the Steampunk genre has allowed them to draw upon their varied and eclectic musical influences which include Kate Bush, Motorhead, The Cure, Brian Eno, The Damned, Siouxsie & The Banshees to name but a few ... Although South-West based, The Mysterious Freakshow are presently gigging across the UK. They are also currently working on their debut album due for release IN 2014. The Mysterious Freakshow have recently begun hosting their own Steampunk events in conjunction with the Exeter Phoenix Arts Centre. These events showcase the vastly varying vaudeville performers and performances involved in the Steampunk Scene. If you would like to get involved with one of these events please message The Mysterious Freakshow at themysteriousfreakshow@yahoo.com What is STEAMPUNK? ‘Steampunk’ refers to any of the artistic styles, clothing fashions, or subcultures, that have developed from the aesthetics of steampunk fiction, Victorian-era fiction, and films from the mid-20th century. Steampunk is first and foremost a literary genre, or at least a subgenre of science fiction and fantasy that includes social or technological aspects of the 19th century (the steam) usually with some deconstruction of, reimagining of, or rebellion against parts of it (the punk). The Artists: Fey Pink works closely with her producer KIKI in France to create wierd electronic wonders. Tracy Austin is a very accomplished grade 8 drummer with a wealth of DEPs behind her. Kye Godfrey lives with his head in a bass amp listening to the heaviest & loudest of music and has a number of bands under his belt including The Toretz and The Two Hats - He is also 1 half of the anarchic radio show Revolutionary Radio. Our Guitarist, Tom Rosenbloom is another multi-instrumentalist who is usually found behind drum kit for bands such as The Toretz and Skaper. Description Influences from DarkWave, Punk, Rock & Goth with splashes of Ska. The Freaks are a unique & eclectic bunch! A must hear! We are a collection of marvellous loons making music and mayhem in the Moonlight bathed in steam with lots of Punk attitude! We take nods from the likes of Siouxsie & The Banshees, Cocteau Twins, The Cure, Kate Bush, The Clash, The Sundays, Manu Chao, The Pixies, Portishead, Massive Attack, The Prodigy, Sinead O'Connor, The Gossip, Skunk Anansie, Slayer, Motorhead ... well the list it go on and on and on ... needless to say we really LOVE Music of all genres and we try and make our music reflect our unusual mix of influences.